Sign up NOW for your FREE account. You can choose to sell items and also register to HELP OUT at the sale to shop early and earn more too! It takes many hands to put on CentralCal's largest kid's & maternity consignment sales event, and simply put, we love and need YOU! - If you consign, you'll earn more - 70%! 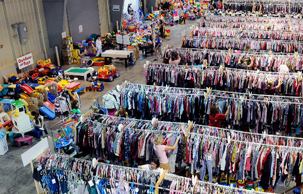 Help is needed with everything from handing out flyers before the event to organizing merchandise onsite, setting up, during sale week and breaking down the event. Its so much fun being apart of our JBF Team! Be sure all your items are tagged and ready (see info below) Clothing and items sorted in size order helps speed up your drop off. At 2:01pm remaining items are donated to our charity partner. Sorry, no exceptions! Send a friend if you can't make it and want to get your items. We sell children's clothing Preemie/Newborn through size 20 & Juniors (Junior items, NO womens styles... bring the brands that sell best, Abercrombie, Hollister, Roxy, American Eagle, Nike, Volcom, Burton, etc) as well as maternity sizes (bring your best and in style maternity clothing) If your unsure if your junior styles qualify please contact us. 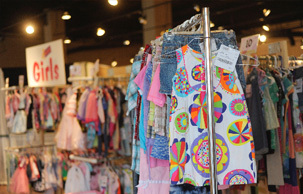 Winter clothing only(what your child would wear between Dec-March) NO Shorts, Tank tops or spring dresses. Be picky. Look at your clothing items as if you were going to purchase them. No stained or damaged items will be accepted. Please freshly clean your clothing items. Replace missing buttons, sew loose hems and seams, and clip loose threads. Please button all buttons, snap all snaps, zip all zippers before you arrive at drop off. This will ensure that there are no defects in the clothing. The newer the item looks (and the better it smells), the better it will sell. Package: Fasten shoes together with zip ties. For infant shoes or small shoes without laces, you may put the shoes in a clear zip-lock bag. Tag: attach it to item with ribbon, string, zip tie or safety pin. If item contains multiple pieces, be sure all pieces are included and list number of items on JBF tag description. Package: Use clear, self-seal bags or clear cling wrap (saran wrap) to hold multiple items together; Tie sets of books together with ribbon/string (no yarn). Be sure that parts/games to video game systems (such as Vtech) cannot be separated or switched out at the sale. Tag: When tagging books, please attach your tag to the book with PAINTERS TAPE FOR BOOKS - that can be removed without damaging the item. Tape tag to the outside cover of glossy books and to the inside cover of books that will easily tear when removing the tag. Please do not use masking or double sided tape. Hole-punch JBF tag and tie to sets. If you qualify, please request a Valet Consignor spot. You will receive a confirmation email right away to confirm your sign up and schedule drop off. You aren't given a spot on the list till you drop off - so do so ASAP. Perfect Consignors List is posted in FB Group and emailed before drop off.